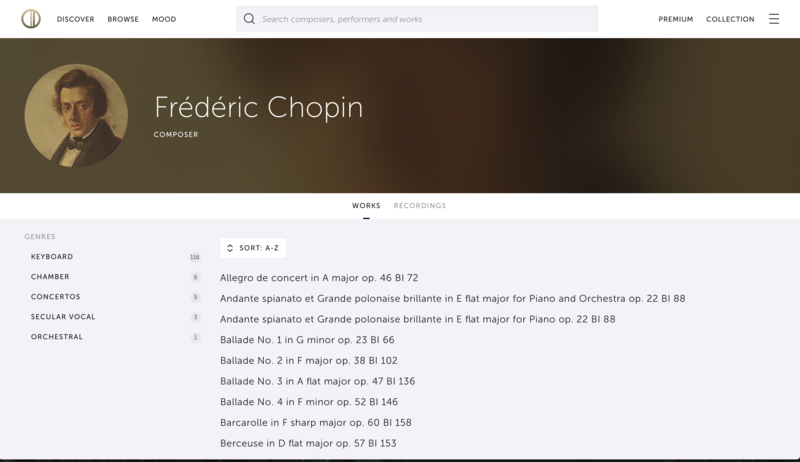 IDAGIO is designed to make finding, filtering and comparing classical music a joy. Classical music is uniquely structured compared to other types of music – IDAGIO is specifically designed for that structure. To get started, click on Browse to see the categories by which you can explore: composer, period, instrument, performer or genre. Then select from popular options or click to see all. If you click on a composer, for example, you can then view and filter works, or click the recordings tab and filter by a range of criteria.